Providing a fascinating overview of healthcare spending and cost-containment mechanisms in the US, this book explores the consequences of managed care for the community with particular attention paid to doctor-patient relationships. The author studies this significant relationship from a social perspective arguing that shifting financial risk onto doctors in a profit-making system seriously damages patient trust. In addition this undermines overall social capital, which in turn has been linked to health outcomes. Including case study examples and policy implications, this insightful text explores an important, though little-discussed outcome of healthcare reform and will be a welcome addition to the current healthcare literature. 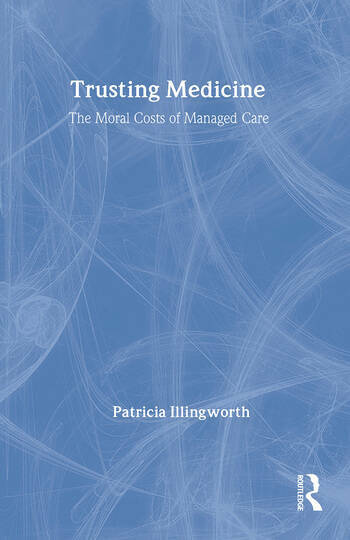 Patricia Illingworth is a member of the Massachusetts Bar and an Associate Professor at Northeastern University, where she teaches medical and business ethics, as well as health policy and bioethics and the law. Professor Illingworth also teaches psychiatry, ethics, and the law at the Harvard Medical School and has published widely within the field of medical ethics on topics such as professional ethics, truth-telling in the doctor-patient relationship, the fiduciary duties of physicians, global bioethics, the ethics and public policy of HIV/AIDS, and the ethics of managed care and other healthcare organizations.